Spotify has officially confirmed that its platform’s audience is now made up of more than 140m monthly active users. The figure represents a 40m climb on the figure Daniel Ek announced this time last year – and is up by a very impressive 100m people compared to May 2014. Spotify confirmed that it had surpassed 50m paying subscribers in March this year. Three months on, at its typical rate of growth, you’d expect this figure to have hit somewhere close to 55m. The 50m we know about would represent a conversion rate from 140m users of 35.7% – while 55m subs total would equate to 39.3%. Both figures are higher than the 31.5% active-to-paying user rate we calculated for 2015. Meanwhile, Spotify has also confirmed that its advertising revenue grew by 50.3% in 2016 – which according to MBW’s calculations would total around €294m. In 2015, this ad revenue figure grew by 98% year-on-year to €195.8m. 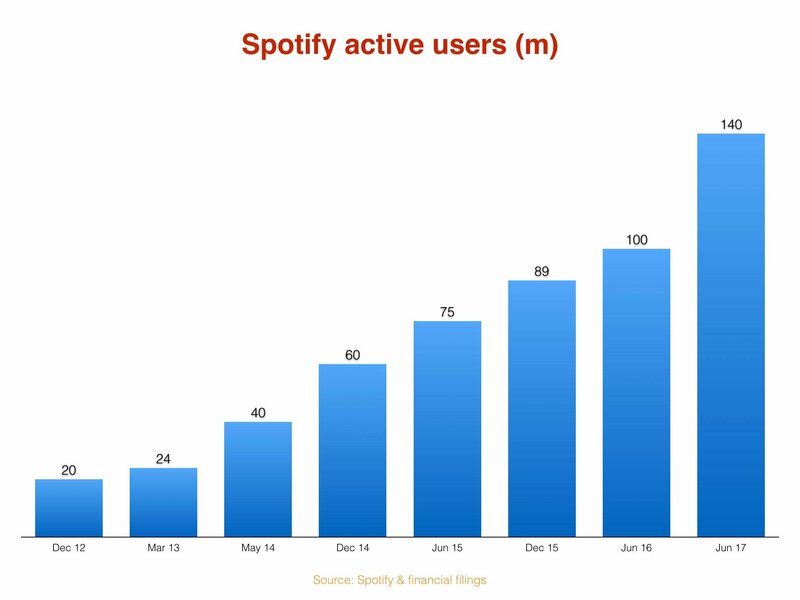 The 40m jump in active users since June last year means that Spotify has been adding 3.3m a month over the past year. That’s not far off double the rate of growth Spotify was experiencing from June 2015 – 2016 when it was adding around 1.8m active users to its service every month. Today’s news was revealed today in a blog post by Brian Benedik, who is Vice President and Global Head of Sales at Spotify.